Rosetta spacecraft provided this montage, comprising four individual NAVCAM images taken from 18.7 miles (30.1 km) from the center of Comet 67P/Churyumov-Gerasimenko, on Dec. 1, 2014. Where did Earth's water come from? Comets? Asteroids? New data from the Rosetta spacecraft exploring Comet 67P/Churyumov-Gerasimenko show that comets — once thought responsible for seeding Earth with water — might not have delivered most of the planet's water after all. The new finding is giving scientists a more nuanced view of the solar system and its plethora of cosmic bodies. If even a small number of comets like 67P/C-G impacted Earth in the early days of the solar system, it still would have greatly changed the molecular composition of the planet's water today, according to Altwegg. 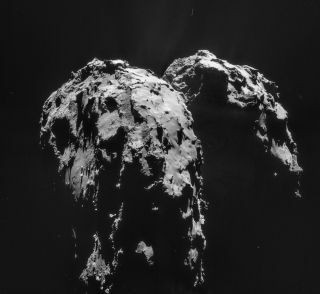 Therefore, it seems unlikely that these kinds of comets brought water to Earth. Altwegg thinks it's more probable that asteroids brought water to Earth. "We knew that Rosetta's in situ analysis of this comet was always going to throw up surprises for the bigger picture of solar system science, and this outstanding observation certainly adds fuel to the debate about the origin of Earth’s water," Matt Taylor, ESA’s Rosetta project scientist, said in a statement. While asteroids are dry, rocky bodies now, it's possible that these space rocks were water-rich during the early days of the solar system. Altwegg thinks that asteroids may have bombarded the Earth about 800 million years after the formation of the solar system, bringing water to the early planet once it cooled after formation. This European Space Agency graphic details the Rosetta spacecraft's first measurements of the water on Comet 67P/Churyumov-Gerasimenko, which scientists say is surprisingly very different than the water found on Earth. Scientists have measured the D to H ratio in meteorites from asteroids and found that the water content in these tiny samples is comparable to Earth's water composition, Altwegg said. Thanks to Rosetta, scientists now think that Kuiper Belt comets — found orbiting the sun beyond Neptune — are much more diverse than expected. In other words, not all comets are the same. Although Comet 67P/C-G has a 6.5-year orbit that brings it near Jupiter, researchers still think that it originated in the Kuiper Belt. Scientists measured the comet Hartley 2's D to H ratio in 2011 and found that it was very close to that of Earth's, leading scientists to conclude that comets like Hartley 2 (a Kuiper Belt comet) may have delivered water to the early planet. But because the ratio for Comet 67P/C-G is so off, it doesn't seem like the comets from the Kuiper Belt could have seeded the planet with water. Comet 67P/C-G's D to H ratio is much higher than even comets found in the Oort Cloud, an icy mass of cosmic bodies on the outskirts of the sun's influence. Comets in the Oort Cloud were ruled out as possible water deliverers long ago because of their different ratio. "This surprising finding could indicate a diverse origin for the Jupiter-family comets — perhaps they formed over a wider range of distances in the young solar system than we previously thought," Altwegg said. "Our finding also rules out the idea that Jupiter-family comets contain solely Earth oceanlike water, and adds weight to models that place more emphasis on asteroids as the main delivery mechanism for Earth’s oceans." Officials working with the Rosetta spacecraft are also hoping to fly the spacecraft through one of the jets of the comet as it makes its way around the sun. Rosetta should continue flying with the comet through its closest approach to the star in August 2015.